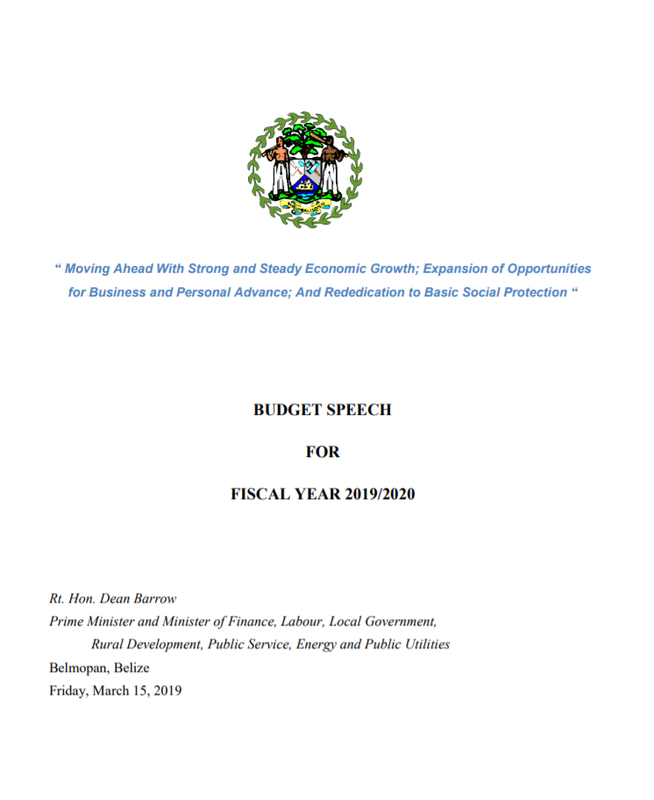 Budget Speech for Fiscal Year 2019/2020: Moving Ahead With Strong and Steady Economic Growth; Expansion of Opportunities for Business and Personal Advance; And Rededication to Basic Social Protection. Presented by Hon. Dean Barrow, Prime Minister and Minister of Finance, Public Service, Energy & Public Utilities. 15 March 2019. 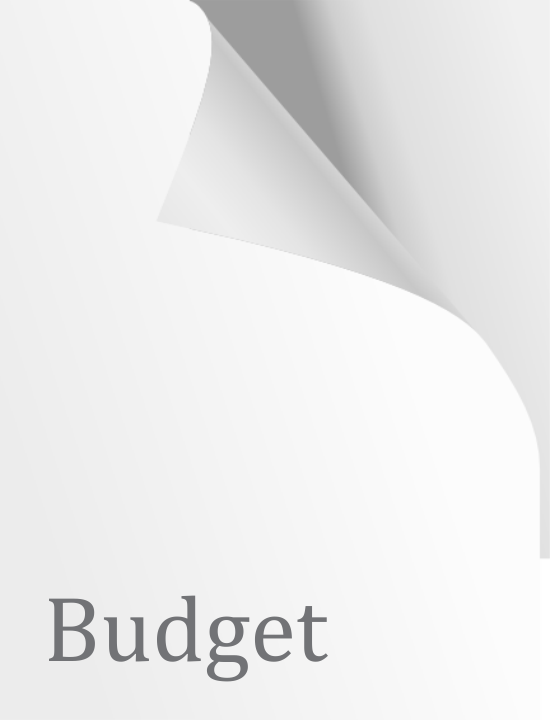 2019/2020 Budget Speech for Fiscal Year 2019/2020: Moving Ahead With Strong and Steady Economic Growth; Expansion of Opportunities for Business and Personal Advance; And Rededication to Basic Social Protection. Presented by Hon. Dean Barrow, Prime Minister and Minister of Finance, Public Service, Energy & Public Utilities. 15 March 2019. 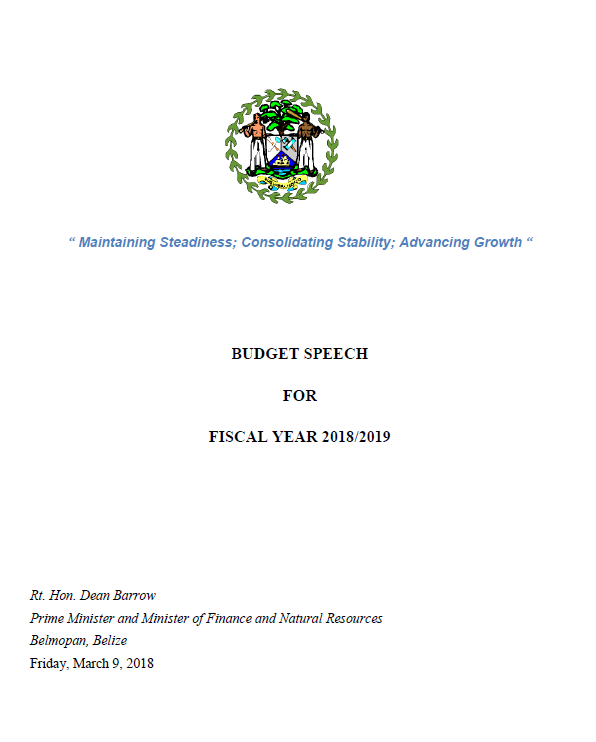 2018/2019 Budget Speech for Fiscal Year 2018/2019: Maintaining Steadiness; Consolidating Stability; Advancing Growth. Presented by Hon. Dean Barrow, Prime Minister and Minister of Finance, Public Service, Energy & Public Utilities. 9 March 2018. 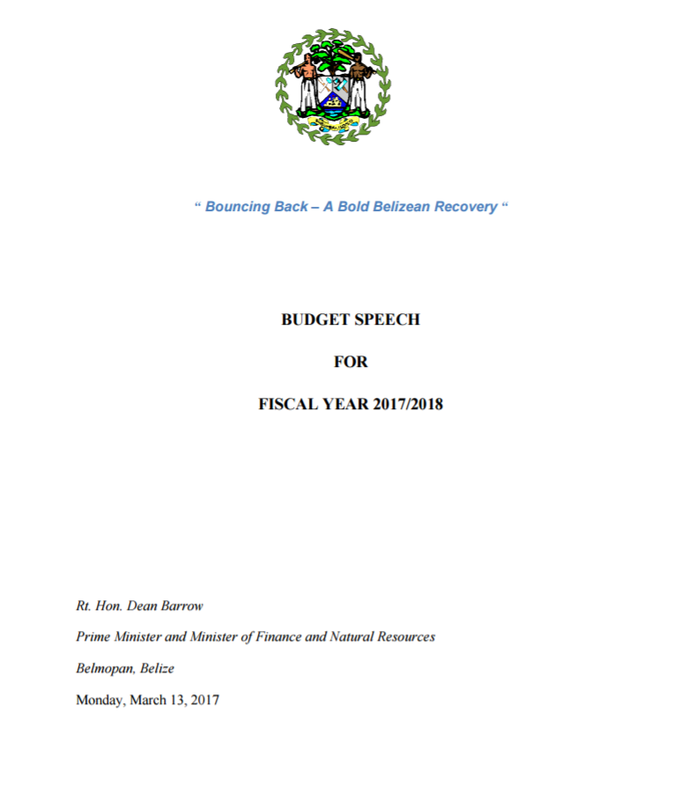 2017/2018 Budget Speech for Fiscal Year 2017/2018: Bouncing Back - A Bold Belizean Recovery. Presented by Hon. Dean Barrow, Prime Minister and Minister of Finance, Public Service, Energy & Public Utilities. 13 March 2017. 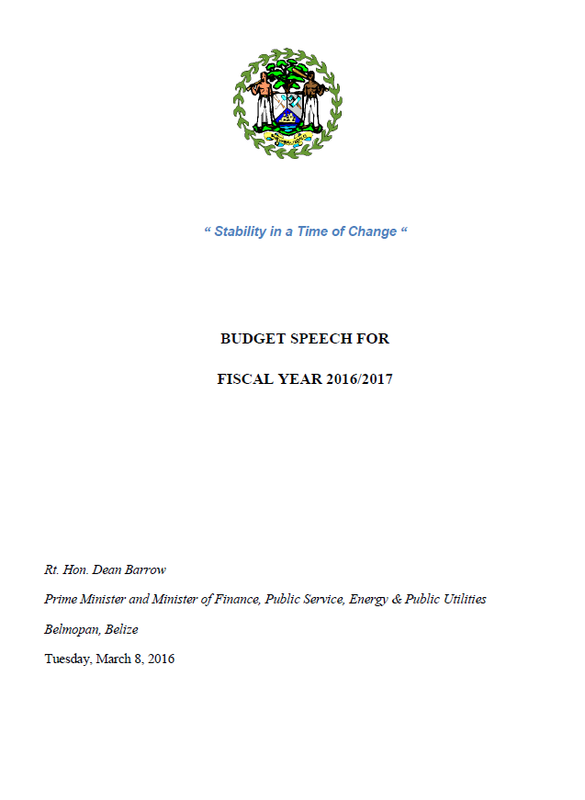 2016/2017 Budget Speech for Fiscal Year 2016/2017: Stability in a Time of Change. Presented by Hon. Dean Barrow, Prime Minister and Minister of Finance, Public Service, Energy & Public Utilities. 8 March 2016. 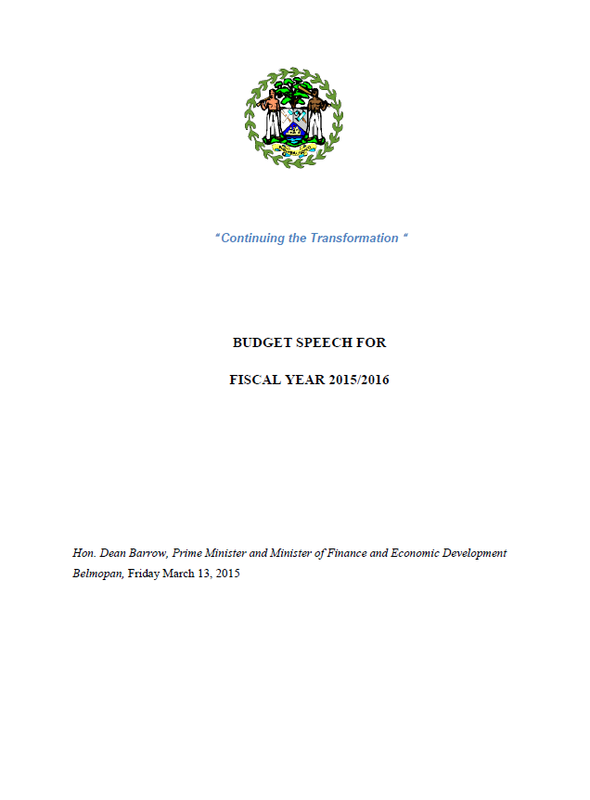 2015/2016 Budget Speech for Fiscal Year 2015/2016: Continuing the Transformation. Presented by Hon. Dean Barrow, Prime Minister and Minister of Finance and Economic Development. 13 March 2015. 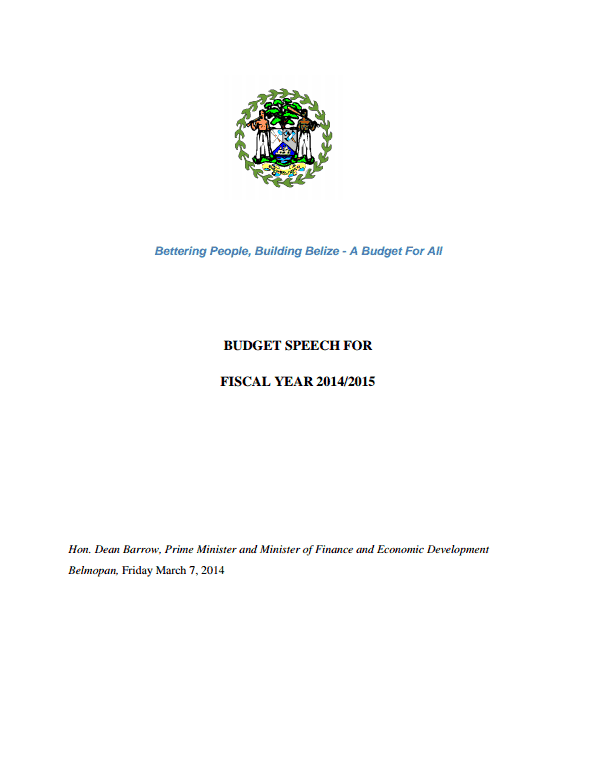 2014/2015 Budget Speech for Fiscal Year 2014/2015: Bettering People, Building Belize - A Budget for All. Presented by Hon. Dean Barrow, Prime Minister and Minister of Finance and Economic Development. 7 March 2014. 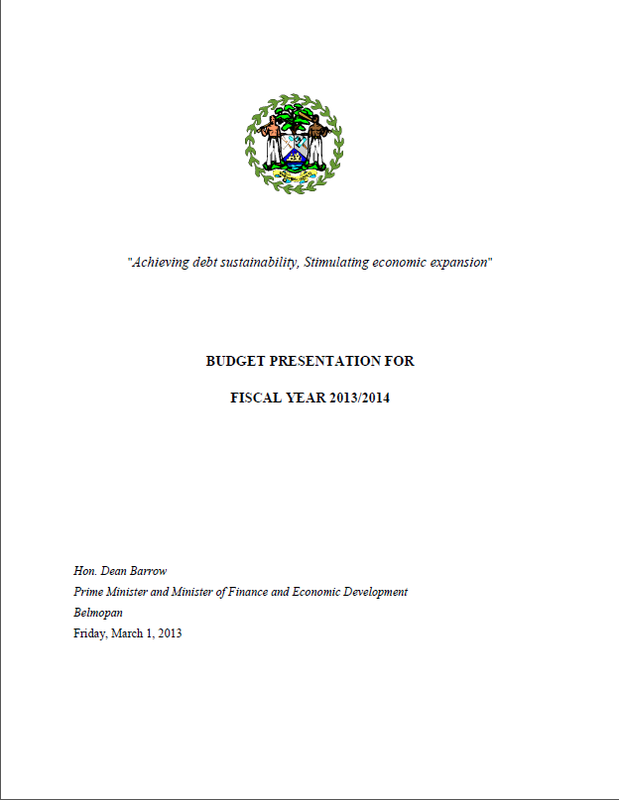 2013/2014 Budget Presentation for Fiscal Year 2013/2014: Achieving Debt Sustainability, Stimulating Economic Expansion. Presented by Hon. Dean Barrow, Prime Minister and Minister of Finance and Economic Development. 1 March 2013. 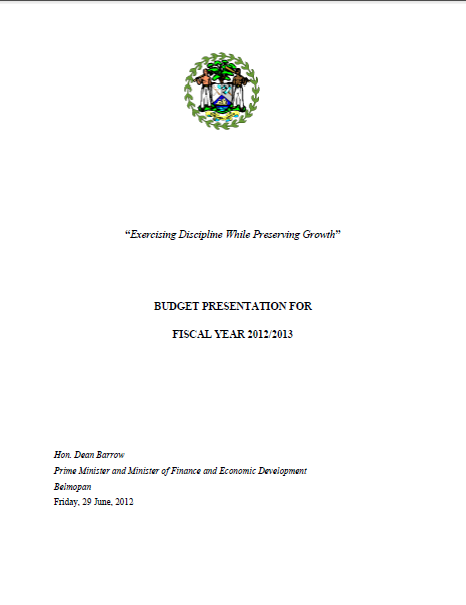 2012/2013 Budget Presentation for Fiscal Year 2012/2013: Exercising Discipline While Preserving Growth. Presented by Hon. Dean Barrow, Prime Minister and Minister of Finance and Economic Development. 29 June 2012. 2011/2012 Budget Presentation for Fiscal Year 2011/2012: Celebrating Growth, Sustaining Recovery. Presented by Hon. Dean Barrow, Prime Minister and Minister of Finance. 11 March 2011. 2010/2011 Budget Presentation for Fiscal Year 2010/2011: Recovery Today, Prosperity Tomorrow. Presented by Hon. Dean Barrow, Prime Minister and Minister of Finance. 15 March 2010. 2009/2010 Budget Presentation for Fiscal Year 2009/2010: Overcoming The Challenges and Pursuing the Opportunities. Presented by Hon. Dean Barrow, Prime Minister and Minister of Finance. 6 March 2009. 2008/2009 Budget Presentation for Fiscal Year 2008/2009: Realizing The Possibilities. Presented by Hon. Dean Barrow, Prime Minister and Minister of Finance. 14 July 2008. 2007/2008 Budget Presentation for Fiscal Year 2007/2008: Facing, Fixing, Moving Ahead, Presented by The Rt. Hon. Said W. Musa, Prime Minister and Minister of Finance and the Public Service. 2 March 2007. 2006/2007 Budget Presentation for Fiscal Year 2006/2007: Charting a Way Forward. Presented by The Rt. Hon. Said Musa, Prime Minister and Minister of Finance, 17 March 2006. 2005/2006 Budget Presentation for Fiscal Year 2005/2006: Delivering a Bettr Quality of Life for All Belizians. Presented by Hon. Said Musa, Prime Miister and Minister of Finance and Defence. 14 January 2005. 2004/2005 Budget Presentation for Fiscal Year 2004/2005: Rebalancing Growth to Work for All Belizians. Presented 24 January 2004. 2003/2004 Budget Presentation for Fiscal Year 2003/2004. Preented 17 January 2003.